Briard is a very old French dog breed. Its portrait has been found in old tapestries and other works of art, some dating back to the 8th century. Briards have served as livestock and property guardians, as perimeter sheep-herders, and, during the World Wars, as military sentries and guards. They were also used to find wounded soldiers on the battlefield. So many Briards were used during the war that the breed was threatened with extinction. Today, the breed is still used as a herding dog. The Briard is a big dog, standing 22 to 27 inches tall and weighing 70 to 90 pounds. The Briard’s head is long, the eyes are large, and the ears are natural or cropped. The body is slightly longer than tall, and the chest is broad and deep. The breed has two dewclaws on each rear leg. The identifying characteristic is the coat; even the head and ears are well-covered with a long, coarse coat. The coat is a double one; the undercoat is fine and tight. The coat is usually tawny, with deeper colors preferred, and often darkens with age. The Briard requires constant care to keep the coat in good shape. Without daily brushing and combing, it will mat. Daily brushing also lessens the amount of coat shed in the house. The hair in the ears and between the pads of the feet needs regular trimming, and many owners trim the hair over the eyes so they can see their dogs’ eyes. Some pet owners have the coat trimmed short, especially in the summer months. Briards need vigorous daily exercise, and a walk or two every day is not nearly enough. A Briard is great for an active owner and can run alongside a bicycle, go jogging, herd sheep, play agility, or catch flying discs. Bred to work, the Briard will get into trouble if they don’t have something to do and a chance to burn off excess energy. Early socialization is vital, as this is a watchful, protective breed. Socialization to a variety of people, places, sounds, sights, and things can help her adjust to her surroundings. Unfortunately, some Briards—especially those who are not well-socialized—are overprotective, which can lead to aggressive behavior. Training should begin early, too, and continue into adulthood. This breed is bright and intelligent and enjoys a mental challenge. Training should be structured and firm (but not heavyhanded), yet fun and challenging. Briards enjoy many dog sports, including agility, herding, trick training, and flyball. This breed is not for a first-time dog owner; even many experienced dog owners may find her to be a handful. The Briard needs an owner who can also be her leader. 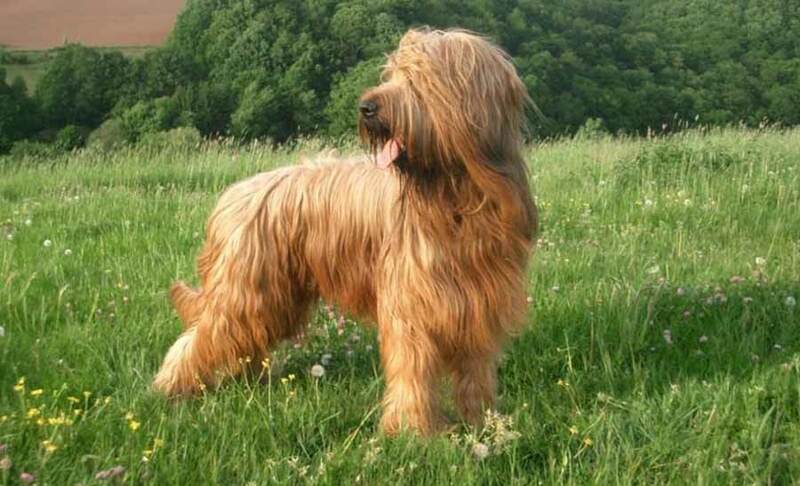 Briard dog breed is not good when left alone for many hours every day, and when bored will get into trouble. With company and leadership, she is an affectionate, loyal, and devoted companion. She can be good with children when raised with them but will not tolerate teasing or disrespect. She can be dog-aggressive if not socialized with other dogs early. The breed tends to herd anything that moves, including kids and the family cat. Health concerns include bloat, torsion, and hip dysplasia. Note: Upload only Briard picture or your picture with Briard below - spammer's ip may be blocked. Vigorous and spirited in body, independent and purposeful in mind, the Briard can be serious (“a reserved philosopher”) or a humorous clown. His light, supple gait, like that of a large feline, has been described as “quicksilver,” permitting him to make the springing starts, abrupt turns, and sudden stops required of a shepherd dog. Athletic and agile under that long coat, the Briard needs some hard exercise each day. Mental exercise (herding, agility, tracking) is just as important to this thinking breed. Matching his stern appearance, he is aloof and discriminating with strangers, keen-eyed and watchful. Socialization must be early and frequent so that his watchfulness does not shade into aggression or shyness. Spookiness is unfortunately present in some lines. Most Briards are territorial with other animals, but usually good with the pets in their own family, if raised with them. You must discourage his habit of poking or pushing people and other pets with his huge, powerful head in an attempt to keep them within boundaries. Briards like to control situations and require a confident, consistent owner who knows how to lead. However, they are very sensitive (sometimes overly so) and must be treated with respect and a light hand. This breed has a long memory and doesn’t easily forgive or forget harsh handling.